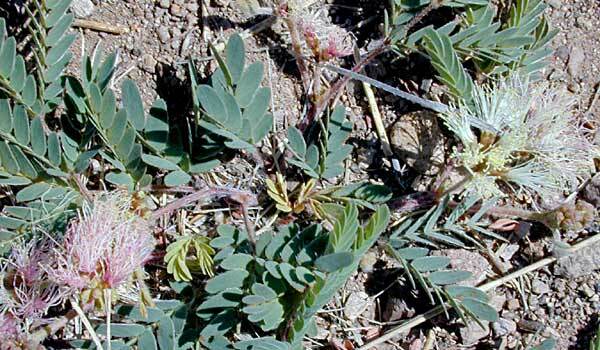 Other names: Calliandra, false mesquite, dwarf stickpea. Notes: This species is much smaller than the normal fairy duster, being only a few inches tall. Each pink puff contains several flowers,having long stamens, tipped with pink and white at the base. These are followed by flat, brown seed pods, containin 2 seeds, which split open when ripe, the halves standing wide apart. This plant is thornless and binds the soil. 3 species of Calliandra in Arizona. Dwarf stickpea plant profile on the USDA Plants server.